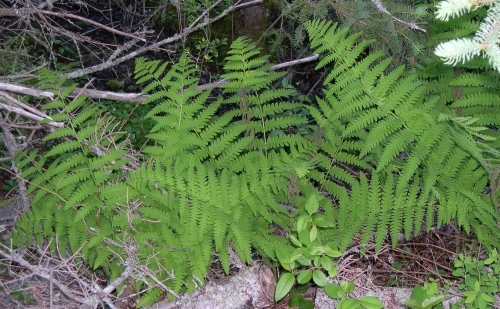 Ferns add a touch of freshness and elegance to Nova Scotia’s forest floors in late spring. These beautiful green plants can also be found growing along ditches and in rock crevices. Ferns first appeared on the planet hundreds of millions of years ago and are still thriving. They reproduce by spores or rhizomes and are quite resistant to disease. Ferns provide the surrounding soil with mineral nutrients while the structure of their rhizome root systems reduce soil erosion. 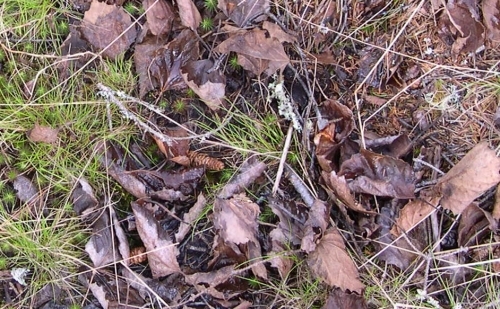 The sensitive leaves of these bioindicators are easily damaged by acid rain. 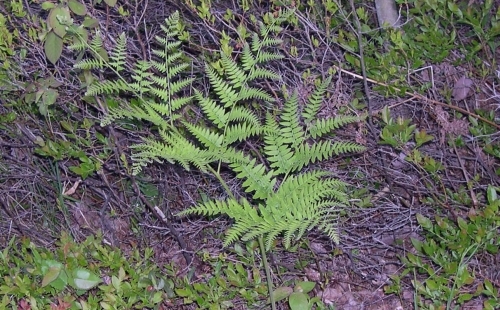 Even in Nova Scotia’s temperate climate, ferns can grow to several feet in height. Their leaf litter is so great that mounds are often formed in forest areas where they thrive from year to year. 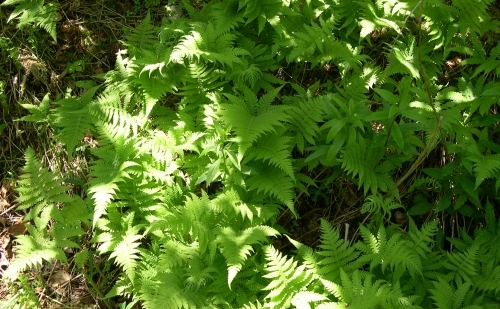 Moisture, shade and acidic soil attract the growth of both ferns and mosses. 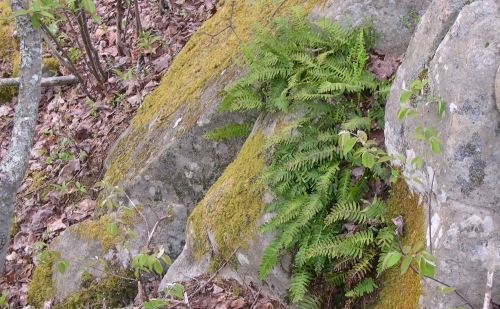 Polypody ferns, shown above, crop out of rocks near the salt marsh. 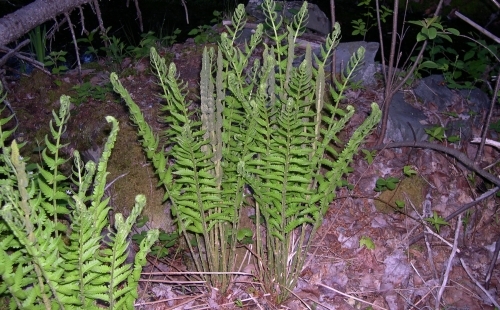 In springtime, many people enjoy eating fiddleheads, the shoots of young ferns. Ostrich ferns are especially tasty. However, the safety of bracken ferns, shown above, is questionable. Its consumption has been implicated in cases of stomach and esophageal cancer, especially in Japan where it is widely eaten. 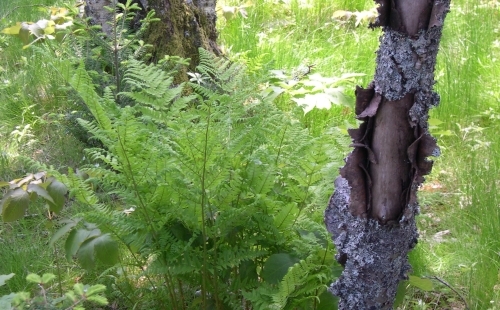 Water from sources near growths of bracken ferns is also considered suspect. 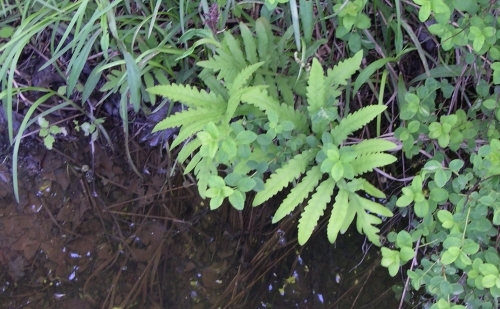 (For more information on the toxic effect of bracken ferns on water, see The Fatal Fern). Shaded northern beech ferns, shown above, capture bits of sunlight through gaps in the forest canopy. The effect is enchanting. In Finland, gathering fern spores on Midsummer’s Eve is believed to give the gatherer the ability to become invisible. Also, if one was to perchance acquire the elusive fern bloom on this special night, one would be able to uncover the treasure hidden beneath the magical lights of the Will o’ the Wisp. Even if you don’t believe in the magical powers of ferns, or partake of fiddleheads in spring, they nevertheless make a wonderful contribution to the biodiversity of the forest ecosystem. Red-backed salamanders are always a joy to find lying under rocks and beneath the dead leaves in the woods. They are most frequently seen on moist days in spring and fall. These woodland salamanders are amphibians but do not lay their eggs or have a larval stage in water. Adults are lungless and breathe through their skin. Consequently, moist surroundings are crucial to their survival and they are very sensitive to slight changes in their environment. 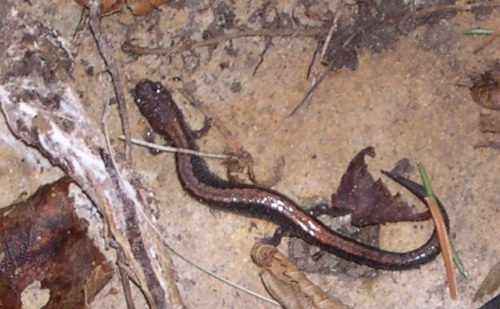 As the weather warms or cools, salamanders bury themselves deeper in the ground or under logs. Years ago, salamanders became associated with fire, probably because they’d seemingly come to life when logs, to which they were clinging, were flung into the fire. Considered by some to be magical creatures, they’ve been known to exist since the Jurassic period. These small creatures eat tiny arthropods found in leaf litter. Their numbers can be quite numerous in eastern American woodlands. Although they keep a very low profile, salamanders contribute to the biodiversity of their habitat and play an important role in the natural recycling process of the forest. 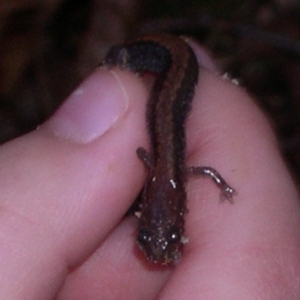 Their gentle nature endears salamanders to many. 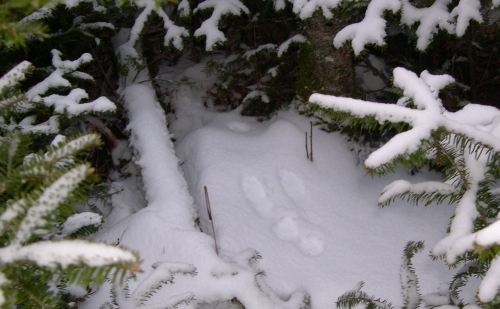 Scientists see them as bioindicators, and employ their numbers to indicate the health of woodlands. Threatened by clear-cutting and extremely vulnerable to fungi and disease, their absence from an ecosystem is cause for concern. Perhaps because of their fragility and silent presence in the woods, these red-backed salamanders are my favorite amphibians. For more information about the mythology surrounding salamanders, see Dragonorama. 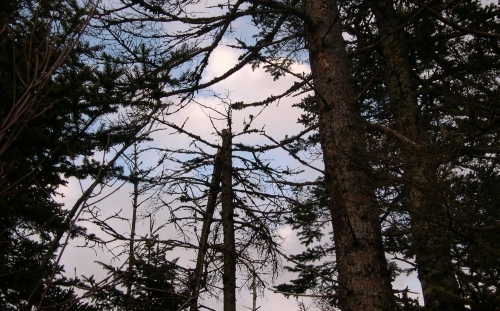 Three species of spruce trees are found in Nova Scotia: white, red and black. All three types grow around Flandrum Hill. Tolerant of shade, they’re often found in stands together along with balsam fir, yellow birch and sugar maple. All are shallow-rooted and susceptible to being toppled by strong winds. 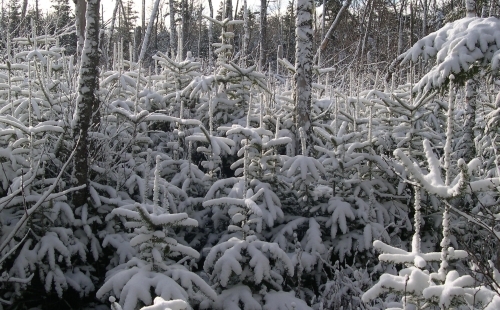 The black spruce can be especially top heavy and is best left growing in a stand in order to remain windfirm. Ripe cones of all three are closed and leathery during wet weather, and open and hard when it’s dry. 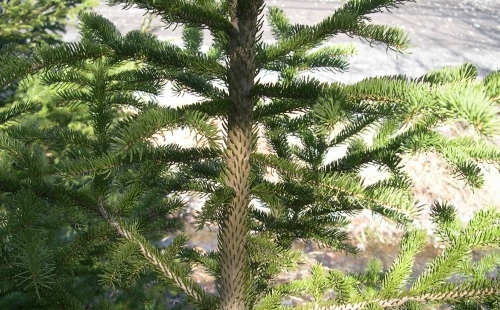 White spruce often has a whitish cast to its green or bluish-green needles. Bark is light greyish-brown. Its cones are the longest of the three types, usually up to 2 inches in length. Green at first, they turn brown in autumn and fall off the tree in winter. 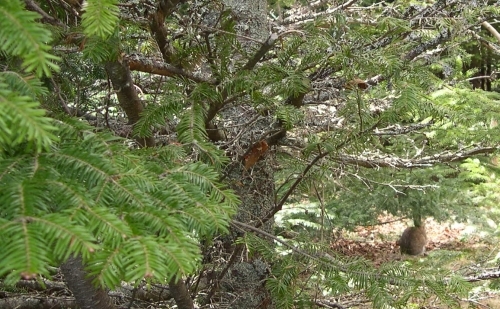 Red spruce growth is confined to Eastern Canada. It is Nova Scotia’s provincial tree. Needles are yellowish-green. Bark is light reddish-brown. 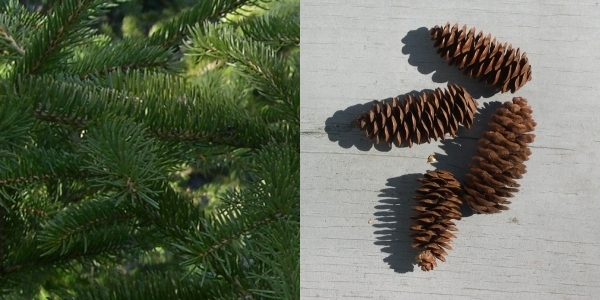 Red spruce can interbreed with black spruce, sometimes making identification between the two difficult. Cones fall off the tree either in winter or the following spring. 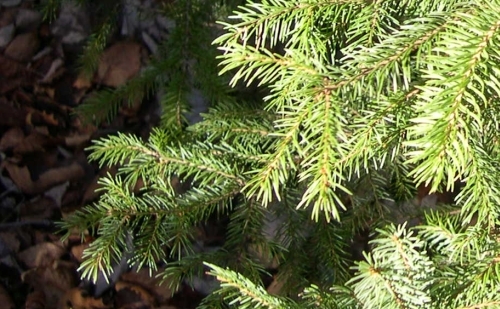 Black spruce have blunt tipped needles that are the shortest of the three (1/2″ long). These trees are often stunted in growth when situated on boggy soil. Bark can be greyish to reddish brown. 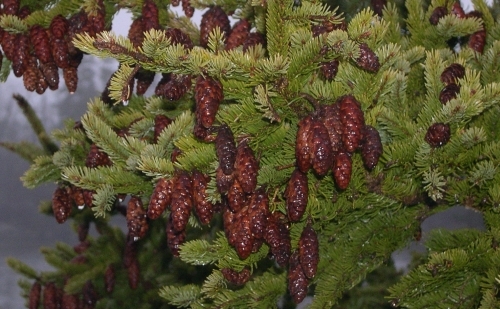 Their cones are egg-shaped and can stay on the tree for years. They can be extremely hard and difficult to open. Individual seeds are black. 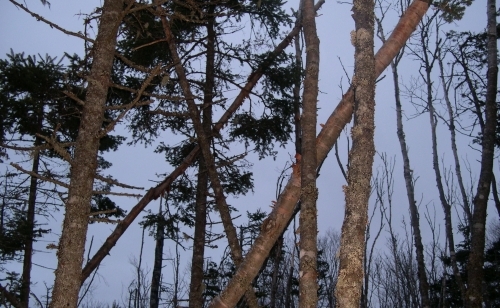 The ability to grow new trees by rooting lower branches in wet moss is unique to black spruce. 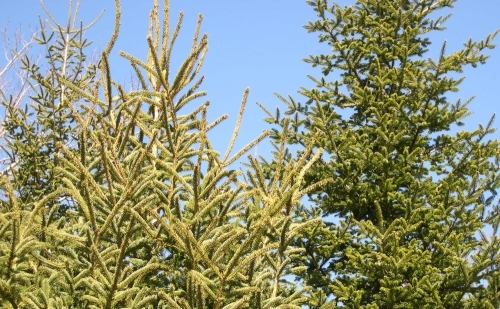 Some diseases and pests have a tendency to prefer one type of spruce over another. It’s best to keep a diversity of trees on your lot, should one species of tree be affected. After numerous days of torrential rains and relentless wind gusts, it’s refreshing to get a glimpse of blue in the sky. Could winter’s fury finally be giving way to a calm resignation that its days are numbered? 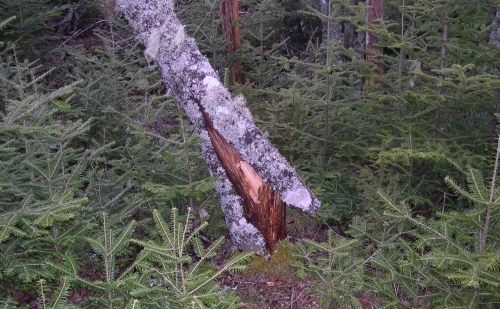 Strong winds caused many tired and weakened trees to snap. There seem to be even more diagonal lines in the forest. Rain water has gathered in the recesses beneath uprooted trees and in lower lying areas in the woods. 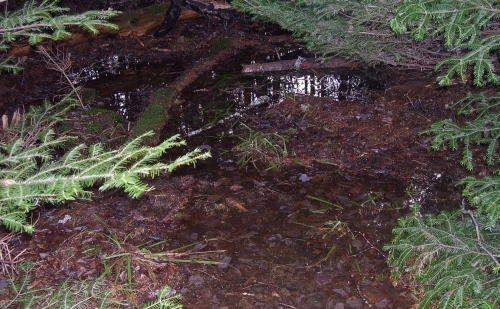 Known as vernal pools, these temporary wet areas not only provide animals with access to fresh drinking water, but also contribute to the biodiversity of the forest. Amphibians thrive around these pools as do numerous varieties of mosses and grasses. They will slowly dry up, but be filled again during subsequent rainstorms. 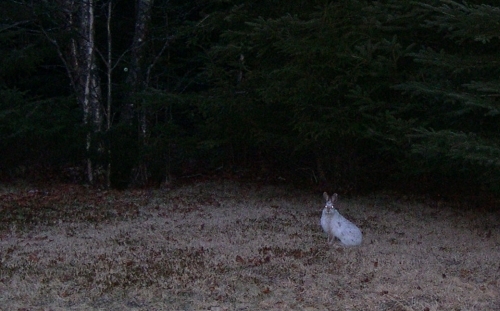 The rain melted all the snow, which is not at all good for snowshoe hares still wearing their winter white coats. By contrasting more with the landscape, they become easier prey for foxes, coyotes and bobcats. Hares will begin acquiring their brown coats later this month. Until then, they’ll just have to keep a low profile and run a little bit faster if they want to survive until spring. After every storm, the sun will smile; for every problem there is a solution, and the soul’s indefeasible duty is to be of good cheer. 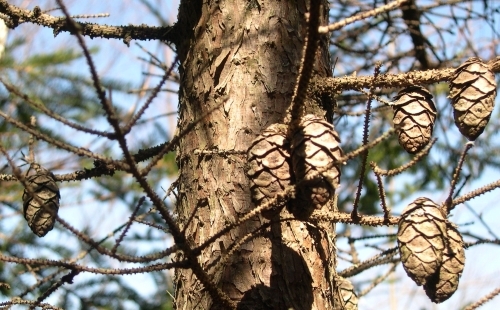 Just a few centuries ago, tall white pines dominated Nova Scotia’s landscape. Most were ten stories high but several even reached fifteen stories in height. Looking at the much shorter firs and spruce that make up the majority of our woods now, it’s hard to believe that the landscape here was once so different. The first settlers from Europe must have been awestruck by the majesty of the forests they encountered. But they soon logged them and cleared the way for agriculture. Today, old growth forests are found on less than 1% of the province’s land. 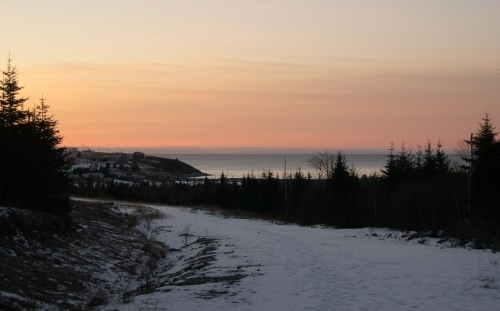 In Cow Bay and nearby Eastern Passage, tracts of forest continue to be cleared to make way for residential development. Most of the time, the trees are removed to facilitate construction. 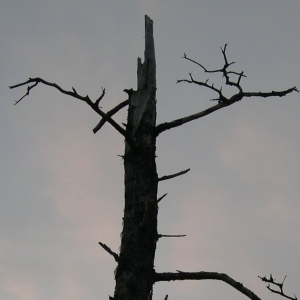 Isolated trees that are left standing die within a few years as they are shallow rooted and top heavy, due to spending most of their life stabilized by other trees in a stand. Trees that are fifteen stories high don’t reach that height overnight. White pine have a lifespan of up to 450 years. Eastern hemlock can live up to 800 years. By cutting down an old growth forest, it’s almost ridiculous to say that you’ve done the planet some good by planting a thousand new seedlings. Yet, incentives created to fight climate change often give points for new plantings while ignoring the destruction of old trees. Biodiversity thrives in old growth forests. Many species of plants (mosses and orchids) and animals (barred owls, wood ducks, fishers and American martens) depend on old large trees for their survival. Some creatures nest in the cavities of standing trees, while others make dens beneath large trees that have fallen to the ground. As I write this, I can hear wind gusts of up to 75 km/hr (47 mi/hr) thrashing the firs and spruce back and forth outside my window. They’re shallow rooted and susceptible to coming down in strong winds. The only white pine in the yard was planted by me almost 20 years ago and is protected in a stand. If it’s allowed to reach its life expectancy, it will likely provide a home for wildlife in 2440. 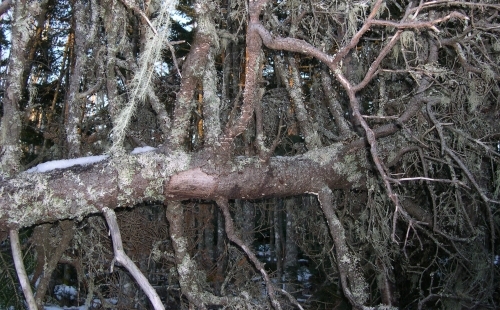 For more information about Old Growth Forests, see Nova Scotia Nature Trust’s pdf on the subject. Details of the 1817 J.E. 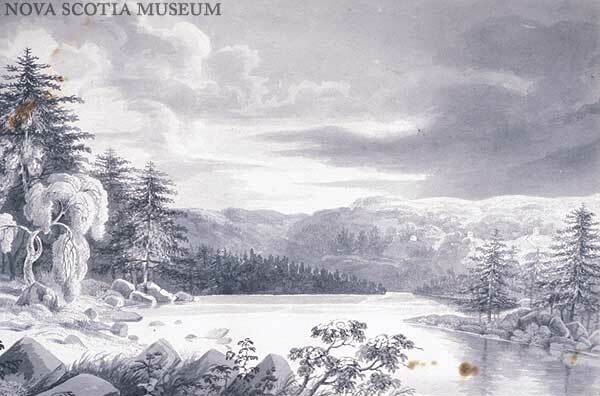 Woolford image of Nova Scotia woods can be found at the Nova Scotia Museum Collection.